Fancy getting your hands on one of these? 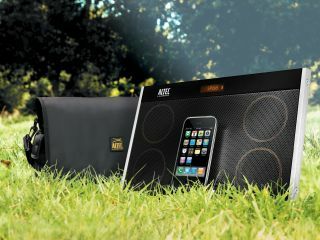 We've teamed up with Altec Lansing to bring you the chance to win one of two InMotion Max Limited Edition ultra-portable iPod docking speaker systems worth £150 each. And then, for two runners up there's the chance to win one of two Plantronics Explorer 390 headsets worth £40 each. The docking system comes with its own specially designed carry bag. It churns out great quality sound from your iPhone or iPod, or any other MP3 player or from the unit's built-in radio. Twin, full-spectrum speakers give you accurate sound reproduction and warm acoustics, while XDB technology supplies the deep bass without a subwoofer. Meanwhile the ESS sound-widening technology expands the sound to fit any room. With batteries providing up to 3.5 hours of continuous play, this is the perfect music accessory. The lightweight Plantronics Explorer 390 headset is designed for in-car use, delivering noise, wind and echo reduction for quality sound. The easy one-touch features enable users to listen and talk easily, while focusing on the road with this user-friendly headset. The multiple charging options mean it can be powered up at home, on the road and in the office and it can be paired with two Bluetooth enabled devices at ay one time. This competition is now closed. The two main winners are Dave Horne and Lyn Ash. The two runners-up are Dawn griffith and Peter Holland. Please note that competition is open to UK residents only. Under 16s must obtain parental consent to enter this competition and be able to demonstrate this to TechRadar's reasonable satisfaction.